Kanchenjunga,is the third highest mountain in the world,and lies partly in Nepal and partly in Sikkim,India. 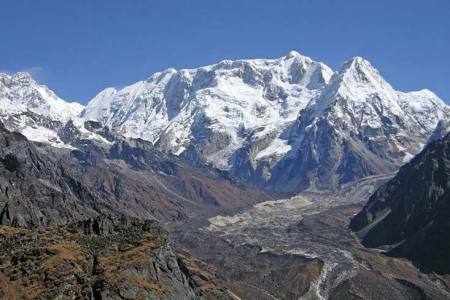 It rises with an elevation of 8,586 m (28,169 ft) in a section of the Himalayas called Kangchenjunga Himal that is limited in the west by the Tamur River,in the north by the Lhonak Chu and Jongsang La,and in the east by the Teesta River. 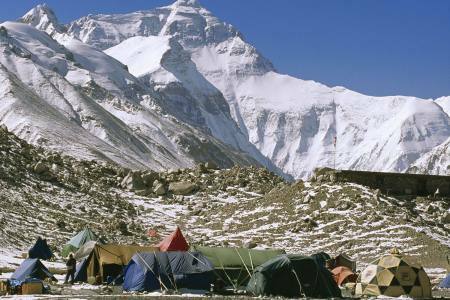 Mount Kangchenjunga lies about 125 km (78 mi) east-south-east of Mount Everest. It is the second highest mountain of the Himalayas.Three of the five peaks – Main, Central and South,are on the border between North Sikkim and Nepal. Two peaks are in Nepal's Taplejung District. The area is rich in wildlife with iconic species such as the snow leopard, Tibetan wolf and red panda at large on the high mountain slopes, pine forests and bamboo jungle. Go in the spring and enjoy the visual feast of over 40 species of rhododendron in bloom, including Nepal’s national flower, the scarlet Lali Gurans. 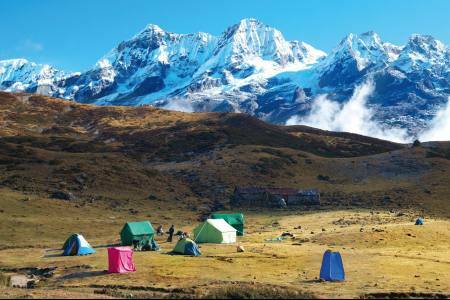 You’ll find the villages along the trails equally vibrant and varied from the Limbu peoples of the lower valleys to the Gurung, Rai and Sherpas of the higher hills. If you’re lucky you may be welcomed in to dance and sing on one of the many festivals, or to try the warm mildly alcoholic tongba from the dark wooden, brass ringed pots. Or try a cardamon tea made from the pods of the many plants growing throughout the lower jungles. With very few other trekkers and climbers on the trails you’re assured a very special experience in these beautiful, wild borderlands. 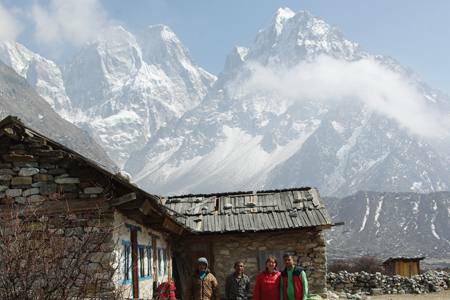 Among the trekking trails in Nepal the trekking trail that leads to the Khanchenjunga region is comparatively new. These twenty six days of trekking takes you to one of the most remote location on earth. The nature and culture of the area is still untouched from modern developments and people have a simple and easy way of life very much dependent on the mercy of nature. We can see the influence of Buddhist traditions, shamanistic practices and little bit of Hinduism in here.The nearest village is Ghunsa, which is the most developed and has quite cozy accommodation. People often claim to have spotted snow leopards on the trail below Ghunsa, especially toward Sele Le Pass.The trail above Ghunsa toward Pangpema is prone to landslides so listen to your trek leader and hurry across any areas, which are dangerous. This will add a couple of days to your trip but as Peak 5950 is not listed under the Nepalese Mountain Association there are no peak fees. 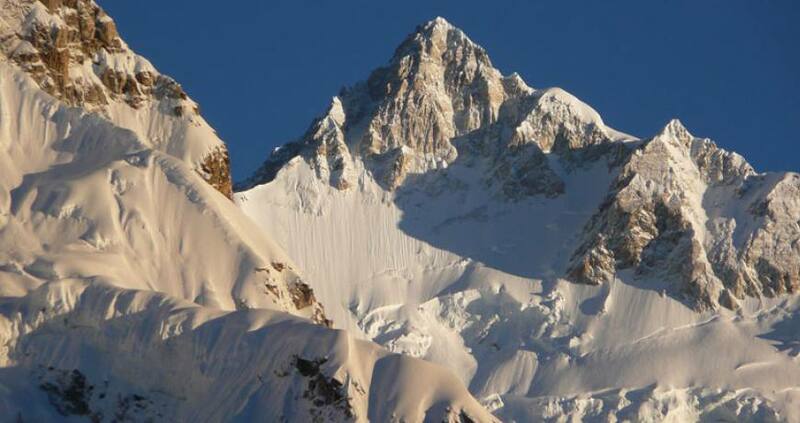 The exact height has not been measured but it is most likely a 6000 m peak. 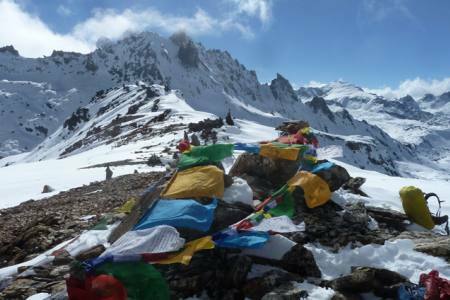 It is also a non-technical summit, so basic mountaineering equipment and skills will get you safely to the summit where photos make the extra effort worth it.As with the North base camp trek, accommodation is very basic and, at higher altitudes small stone huts, which are only open at peak times make camping a reasonable choice. There are always good flat aerie’s to pitch your tent.